I was filing an eBird report the other day, dutifully cataloging the first junco of the year and the various other birds that have been hanging around, when a sparrow flew into my binocular field. A chipping sparrow? Probably ... but this one wasn't so clearly marked. I always have trouble telling the dang sparrows apart. When I open the bird book, I always have to page through dozens of pages of sparrows that are never seen in this county, trying to figure out which one looks most like what I'm seeing. I used to do that with juncos, but then I made a local copy of a wonderful comparison photo Bob Walker published a couple years ago on the PEEC blog: Bird of the Week – The Dark-eyed Junco. (I also have the same sort of crib sheet for the Raspberry Pi GPIO pins.) Obviously I needed a similar crib sheet for sparrows. 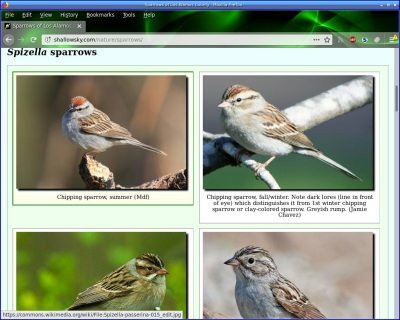 So I collected the best publically-licensed images I could find on the web, and made Sparrows of Los Alamos County, with comparison images close together so I can check them quickly before the bird flies away. If you live somewhere else so the Los Alamos County list isn't quite what you need, you're welcome to use the code to make your own version.